Hand Painted Silk Scarf Happy Memories. Scarf in Blue, Green & Orange. Size 30x30. Silk Scarves Colorado. 100% silk. MADE TO ORDER. 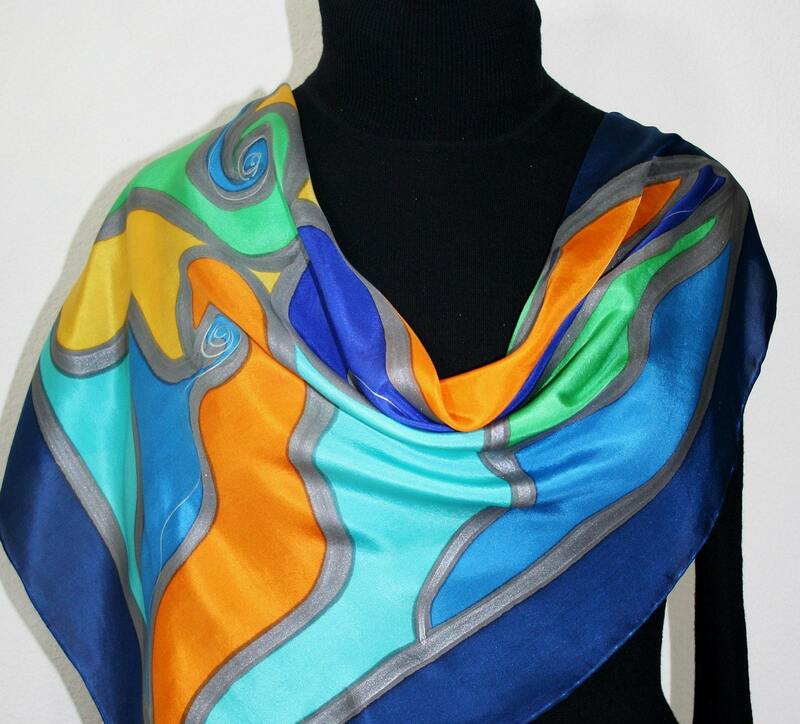 This is a 100% Habotai silk scarf, featuring abstract shapes in hues of steel blue, royal blue, turquoise, green, orange and dark yellow. Outlines are in pewter, with thin spiral accents in silver. The border of the scarf is in dark blue. It is a square silk scarf - very chic, transparent, feminine and elegant. Size : 30"x30" square (76 cm x 76 cm). The scarf comes beautifully gift-wrapped. THIS SCARF IS MADE TO ORDER. Please allow 5-7 days until it is shipped to you. AVERAGE SHIPPING TIME within continental USA is 2-5 days. US shipping: First Class Mail via USPS, with delivery confirmation and insurance. International Shipping: First Class international via USPS. The scarf is 100% silk, hemmed. The dyes are non-toxic and have been steam set for permanence. Slight shrinkage possible due to the steam-setting process. The rich colors blend with the fabric, giving the silk soft and luxurious look and feel. Each silk scarf in this shop is painted freehand; it is unique - a true piece of wearable art. Silk scarves make sophisticated accessories for casual or business outfits, as well as perfect gifts. Care Instructions: Hand wash separately in cold water with mild soap. Hang on a towel rack to dry. Do not bleach. When ironing, use the cooler setting/silk setting, and always iron the scarf on the reverse side. If you follow these simple washing and ironing instructions, and treat your silk scarf with love and care, you will have the pleasure to enjoy it for many years to come.